Now is the time in the election battle where candidates desperately cling to the centreground. Not I. Raised a transpontine I operate a little differently. It is therefore with great pleasure that I present to you my latest mayoral policy. Greater London is faced with both a major housing shortage and the wreckage & waste of economic growth. I envisage London as a zero-growth city that fascilitates community responses to social need. The infrastructure that exists purely for the benefit of economic growth in a major global city must be paralysed – but as creatively as possible. Creative destruction, but not quite as Marx or Schumpeter envisaged it. And so, what do I propose? 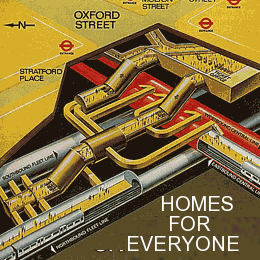 If/when elected mayor I will shut down the London Underground network and allow its stations and tunnels – and, yes, even train carriages – to be used for self-built housing. Subterranean shanty towns, protected from the elements, secure in the warm glow of governmental-acceptance. No state-funded Dale Farm-esque social cleansing in Moneypenny’s London, just simple decent living conditions as a bare minimum for everyone. Now, I’m not a lunatic – I wouldn’t immediately shut down the whole tube network as soon as I arrived in City Hall after May 3rd. My tube housing plan will be a daunting task, so let’s start with the sections most necessary for the Olympics and work our way outwards. This entry was posted on March 22, 2012 at 1:13 pm and is filed under London Mayor 2012, South London. You can follow any responses to this entry through the RSS 2.0 feed. You can leave a response, or trackback from your own site.